One of the reasons I started this blog, was to have a place to hear (and hopefully post) the memories of other people who had experiences at Long Beach. So I was delighted to receive an email from Patrick Fair who shared his memories of his years living at Long Beach. Patrick and his family lived near Schooner Cove area. [Long Beach Wild] fills out the history of a story that I was given the profound gift of being a small part of, for 2 1/2 years in the mid-fifties. The descriptions of the flora and fauna, as well, puts into words that which I have known organically, in my deepest soul, since I was a child. My family lived in what is now the village of Esowista, in a 3-room tar-paper cabin, from the beginning of 1956 to the middle of 1958, while my father worked as a civilian employee at the Tofino Airbase, basically through its final close-down years. It was a small community, constantly changing, consisting mostly of airbase employees and their families (if they had families) – four or five families at most, usually fewer. For the first year (1956) myself and my two siblings were the only children living permanently on Long Beach – and there were never more than 6 to 7 at any one time. Long Beach was truly wild at that time. The Lovekins were seldom there (we called their estate “the millionaire’s mansion”). Peggy Whittington was a friend of my parents, and was like a lovely aunt to us then – and she was surrounded by legends. The legend I knew about the death of her husband was pretty close to the history as you tell it – all the elements were there, if a little mixed up (to me as a child it felt very long ago, although, as you tell in your history, it was only 10 years earlier). And there were ghost stories at Singing Sands – of shipwrecked Spanish sailors pacing over their treasure by night. But mostly, it felt like the beach was all mine. I learned to ride my bike there. I had my first childhood romance. I watched in awe as little airplanes landed on the beach, and tall white sailing yachts came over the horizon to anchor in the bay on summer days. I spent 2 1/2 years, probably the most formative years of my childhood, inhaling the spirit of the place every day – and every day I was truly blessed. I was the oldest, and was given surprising freedom, often spending entire days exploring on my own. It created a core spirituality in me that has lasted my whole life. Thank you, Patrick, for sharing your memories. If anyone else has photographs and memories to share, please get in touch. What beautiful memories! & beautifully written too. Yes, it is beautifully written. Patrick mentioned that he was thinking of getting some of his memories down on paper and I hope he does! Thank you do much for posting my memories, Adrienne. Yes, I am still writing. I am trying to figure out where the “Pacific Heights” community actually was. It could not have been where we lived – there was simply not enough room between forest and beach for such a large “shanty town”. Our cabin was nestled at the forest edge by the far bank of the creek in the postcard (the creek still flows, of course). The “Long Beach community” then consisted of one house on top of the bluff where the road came down, and 10-12 cabins strung along the forest edge from the road to the rocky outcrop at the entrance to Schooner Cove. More than half of the cabins were abandoned, and most were not visible (or only partially visible) from the beach (you can actually see one in the postcard). Perhaps “Pacific Heights” was on top of the bluff, but if so, it had completely disappeared by 1956 (perhaps the Air Force razed it when they initially closed down the wartime base) and the area had been totally reclaimed by the forest. Another possibility – there were overgrown remains of some kind of settlement in the forest above Schooner Cove, which could only be reached by hiking through the bush from the Tofino Road (we called it the “Army Camp” back then). I see I jumped to the wrong conclusion. What you described was not the Pacific Heights (“Dog Patch”) site. The overgrown settlement on the bluff sounds more like the location of that community. I have walked in on the remains of that road. I wonder if the shacks were razed? I will have to ask around. There sure doesn’t seem to be many remains there. It sounds like you may have been on the property that was subdivided in the late 1920s, but Jackson and Ayliffe. The Tugwell and Hillier families had cabins there. Do those names ring any bells? Thanks again. People have been enjoying your memories very much. The Hilliers and the Tugwells are both familiar names to me. Neither family actually lived there during those years. Whether they actually owned any of the cabins at that time, I don’t know for sure. Briefly, here is an overview of the “Long Beach Community” families during the years we were there (1956-1958). National Park was created, when they lost their land and businesses, and moved away to the Parksville/Qualicum area. There was a group of six cabins clustered around the creek and where the road came down to the beach (and right onto the beach in the summertime). The Saxons: (Myrtle Saxon was the community nurse at that time) They had a beachfront summer cabin at the foot of the bluff, closest to the road. They were seldom there, though, usually only on summer weekends. the Tofino wharf, then later was taken on as a crew member at the Tofino Lifeboat station, where he worked till the early 70s, when he retired and they moved away to Saltair. telephone company). They moved to Ucluelet about half way through 1958, then later moved away. I have lost track of them completely. shift lightkeeper at the Amphitrite Point lighthouse, and we moved there just in time for the 1958-1959 school year. In spring 1961, dad lost his job after a change in govenment, and we had to move away (to Shawnigan Lake). The cabin community was connected by a boardwalk, which became a footpath as it passed our cabin. There were three abandoned cabins along that footpath, and one (where the path ended – approximately where the Schooner Cove trail reaches the beach now) was occupied. Gordon and Mary Oikle: I never did know Gordon’s occupation (I knew he was a ventriloquist, though!). I think they were still there when we moved out, and I lost track of them, as well. occupants (I recall a family named Swabee living in one for at least one entire summer). somewhat irrelevant side note, Brian later became a Police Officer in Victoria, where I would occasionally encounter him after I moved there as a young man. Thanks for the informative story. I have visited the Pacific Heights site. I worked for the National Park and laid out an interpretive trail, The Shore Loop Trail, that went through the area behind the reserve and came out back towards the beach through Pacific Heights. That was in the early 1970’s. My last visit to Pacific Heights was probably in the late 1980’s. There were no buildings at that site, just log posts that supported the buildings, and lots of metal bits such as stove pipe etc. There were two other buildings standing in the general area, both more inland of Pacific Heights, one adjacent to the old army road off the Highway and another in the middle of nowhere, but likely associated with radio antennas installed during the War. In the post card photograph the building that is visible just before the rock bluff may be Hilliars house. I did the cultural resource inventory as part of my Park duties and found the remains of a log structure immediately inland of the shore in that area. There were lots of household materials scattered amongst the collapsed building including a stove etc. I also looked after the Parks Historic photo collection and there were photos from George Jackson (lived in the house that became part of the Lovekin property) of his close friends Hilliar’s house which seemed to match the location of the building in the post card. Tugwells had a property and house a bit further east – right where the Schooner Trail came onto the beach and where we had a interpretive theatre from 1972 to 1975. I cannot recall the fate of the small Tugwell house – was it torn down or was it removed to Tofino or Ucluelet? Immediately west of the Schooner trail was the property owned by the Gerbrandt family. They had a house that was moved by the Park into Ucluelet in 1976 becoming staff housing and I lived in it for about 4 years. This house was relatively modern – thus was not there when you lived in that location. In the stretch of beach beyond the rocks but before the shoreline turning opposite Box Island there was one small clearing that might have contained a cabin, probably belonging to Ayliffe who lived in Port Alberni. Hello – I was very excited to find this site. 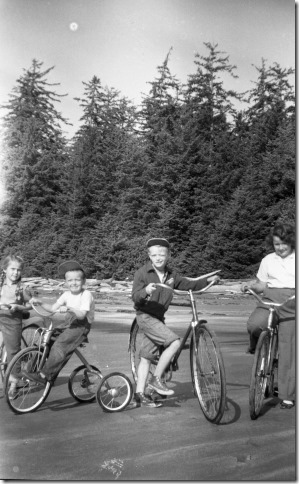 My name is Jacquie (maiden name – Wright) and I was born in Tofino in 1952 and spent the first few years of my life in that area and remember living in one cabin right on the beach. Unfortunately I was too young to remember the areas of the different homes we lived in during our years in Tofino but my sister has a great recollection of them all and I will have to get her to share her memories here. Our family was neighbors to the Fair family . I knew Patrick, Joanne and Matthew. We had also lived in the apartments on the airbase. My Dad worked for BC hydro at that time. I would love to hear from others who knew my family at that time and to see any photos they might have to share from those days – the best memories of my childhood. At present I live in Lake Cowichan – my brother Bob lives in Nanaimo and Gail lives in Hope. Hi Jacquie. Thanks so much for writing and sharing your memories. I hope others will as well! Wow, Jacquie!! Amazing to read your post after what? 56 years at least! I’m actually (sporadically) working on a memoir, the first third of which will be about that incredible, magical place and time. The working title is “A Child At The Edge Of The World” (it will probably never get published, but it’s fun just writing it). Matt and I both live in Victoria, and Joanne (Trottier) in Duncan. I have a few more photos than the ones I posted here, but not many – and none, unfortunately, of your family. Do you have any? If you would like to get in touch, I am on Facebook. I would be happy to share pictures, memories, etc. I came across your blog while searching for family information for my research paper. I am a Hillier. My mother recounts stories of a summer home on Long Beach. At the time my Grandparents owned Maddens General store in Ucluelet. Tragically in 1969 him and his youngest son drowned off of Long Beach. I find all the information fascinating. Thank you so much. Thank you for your note. The Hilliers were a big part of Long Beach! I write about them quite a bit in the book. The brothers were great friends of George Jackson who lived on the beach (near where “Incinerator” is today) and he mentions them often in his journal. I came across this blog while searching for information on Madden’s General Store in Ucluelet. My mother (Margaret) spent time there with her father (Harry Prentice), a pilot, during the late 1930’s , before the war broke out. Her father rented rooms upstairs above Madden’s store, and at the time it was owned or at least, managed by a Japanese family. I don’t recall their names and my mother is no longer here to ask. She did say that they were sent to an internment camp after Pearl Harbour, and she lost contact with them. 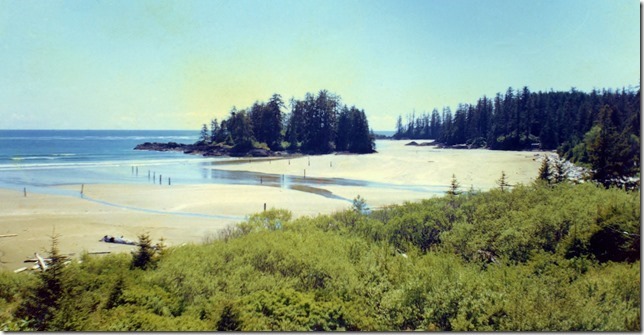 My mother had wonderful memories of her time in Ucluelet. It was a welcome change from life in Toronto. It also marked the end of a long period of estrangement from her father, who had spent his early adult years on his passion, flying, and had left his young family to do so. I am not sure what he was doing in Ucluelet in the pre war years or who he was flying for at the time. My mother referred to her time in Ucluelet as the best summer of her young life. would love to hear more of your stories and memories. My family (Hillier) became the eventual owner of Maddens general store, and after the death of my grandfather on Long Beach, my two aunts became the owners (Margaret Thompson and Ethel Hillier). Both just this year have passed away, but my grandmother Betty Hillier (Foster) is still living in Port Alberni. Just to let you know Margaret Thompson was the soul owner of Madden’s store and Ethel Hillier was an employee and Margaret is still alive today. Hi Patrick, my name is Gail Prodeahl ( Nee Wright ) I was pretty excited when my sister Jacquie sent me this information. I have thought of you and the family many times over the years. I remember our time living near the beach very well. Many an hour we all spent playing and exploring the beach. Walking the boardwalk to all our cabins, our cabin extended a bit right on the creek. We had a hole in the floor with a built in box that was used to keep certain items cold seeing that we didn’t have a fridge back then. Do you remember that we had a iron triangle outside that mom used to clang when we were on the beach so we knew it was time for lunch… LOL. Also the times that your mom carrying a rifle would walk all us kids to the end of the Runway of the Airport to go to school. Then along the runway to school Airforce personell would see that we got to and from school safely when Cougars were sited in the area.Do you also remember a very stormy night and my brother Bob was bringing our Budgie bird over to you place . I don’t remember where we were going,but Bob fell with the cage on the boardwalk over the creek. Of coarse we thought he was gone forever, then some people living at the Airbase found him. We got him back and we had him for a number of years after we left the Island. I have memories of going with my dad to catch crabs and dig the razor back clams. It seemed to me there was always a pot of clamchowder simmering on the stove. I also remember very well Myrtle Saxon the Health Nurse who lived in the first cabin nearest the road to the beach for awhile. She was the one who taught us to swim at Kennedy Lake. Also the many trips over the 27 miles of gravel road from Tofino to Uculet in the back of a old pick up truck….LOL. I can,t believe how close Jacquie and Joanne live so near eachother. I am living in Hope at this point in time.This is so amazing to touch base after all these years, it’s a real treat to reminisce the days gone by. Hope to stay in touch. Thanks for contributing your memories, Gail. (And I’m sorry it took me so long to approve this comment for posting.) It got buried in some emails. I hope you connect with Patrick. Hi Adrienne. Amazingly, thanks in no small part to this blog, the two beach families have reconnected and have been in contact via Facebook since last fall. In less than two weeks, all six “children” from both the Fair and Wright families will be meeting face to face for a walk on that beach, for the first time in 58 years. I have written a little story about that momentous upcoming event, which I will post here separately. I am also going to post the story on the Tofino-Ucluelet Facebook group page. Wow, what a wonderful story, Patrick. I wonder if we could meet up as well? I’d love to say hello to everyone and, perhaps, visit the beach with you to see exactly (or close to) where you lived. I’ll email you separately. Once upon a time, very long ago, before its wonders were discovered by the world, two families lived on Long Beach. In a cabin on one side of the creek were the Wrights, with their children Bob, Gail and Jacquie. On the other side of the creek, connected by a narrow hand-hewn footbridge, lived the Fairs, and their children Patrick, Joanne and Matthew. During all of 1957 and half of 1958, those six children lived every day with paradise at their doorstep. They ran free and wild on the beach and the logs. They splashed in the creek and the surf. They played in abandoned cabins. They all became fast friends, and Gail and Patrick became childhood sweethearts. Then, in July of 1958, RCAF Station Tofino shut down completely. After one final beach party in July of that year, to celebrate Patrick’s and Gail’s 9th birthdays, the little community broke up (to be replaced in later years by a First Nations community). The two families went their separate ways, and lost track of each other completely. Many, many years passed. The six children grew up. Some became parents, some grandparents, some great-grandparents. But their time together in paradise was never forgotten. Then, in the fall of 2015, through an incredible series of co-incidences and Adrienne Mason’s Long Beach Wild book, web site and blog, the children reconnected, and became friends again through social media. And now, on July 6 -in less than two weeks – those children will return to paradise for a joyful reunion, and meet again face to face, for the first time in 58 years! They will walk again on that sand, splash again in that creek, and remember the time when they were children, wild and free, and paradise was their world. Hi, I was just wondering if you have any information about an boat that capsized in the summer of 1969? I think it had too many people on it and it sank or maybe it hit some rocks. I was just a kid and we were camping at what is now Green Point. I remember looking down onto the beach from the cliff and seeing the lights of the cars on the beach as they looked for survivors, and I suspect, bodies. I’ve googled to find a news story but can’t find any information to find out what actually happened. Oops I forgot I had one other question. Does anyone know who Maltby Road was named for? Hi Kelownagurl! Sorry for the delay in responding. I was away on holidays. Maltby Road is named for George Maltby, who I discuss in my book (pages 77-78, 80). He was one of the first to pre-empt (and farm!) on Long Beach, down toward Portland Point. Later he moved into what is now the Tofino area.